I can’t wait for the 21st to come. That’s the second date I am waiting for anxiously this date. The first one is the 17th, which is the Independence Day of Indonesia also the latest date for the Keg to serve lobster. And Mr Ragil kinda promised me we would be dining in the Keg. Maybe, probably, yes..
Anyways, back to the 21st. I will be heading to IKEA first thing in the morning. 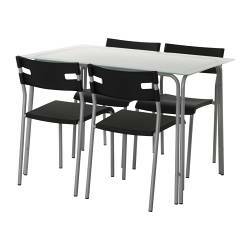 There’s this beautiful dining table and 4 black chairs on sale. The chairs are not so fancy but who cares.. I love the table, it’s made of tempered glass and I found the chairs comfy (had a test seat few days ago, lol). And with the blue-greenish glass color and black chairs, they would be perfect for my new condo, whatever color the wall will be. Then.. MAC cosmetics is having new collection. Of course!! They always do every month.. breaking both my heart and wallet into pieces.. Aaarrggghh.. This month’s collection is called Overrich Collection.. Consist of 8 pretty pigments (heck, these are pigments, and pigments are expensive!!). I definitely want some of those.. Not sure how much I’m getting, they’re pretty pricey.. And that reminds me to stop shopping.. ohhh.. The thing is, I am going home in a month and so I can kind of divide the pigments to other make up junkies back home, and basically get some parts of my money back. LOL..
Another thing.. I am probably going to a MAC pro store in Vancouver just before I head home on a flight. So I really have to be careful and have to calculate my expenses. Because being in a pro store can be dangerous.. and BC tax charges more than in AB. So I guess I need to write down a list of what I want to purchase.. otherwise I’m going home money-less.